LOWELL, Mass. 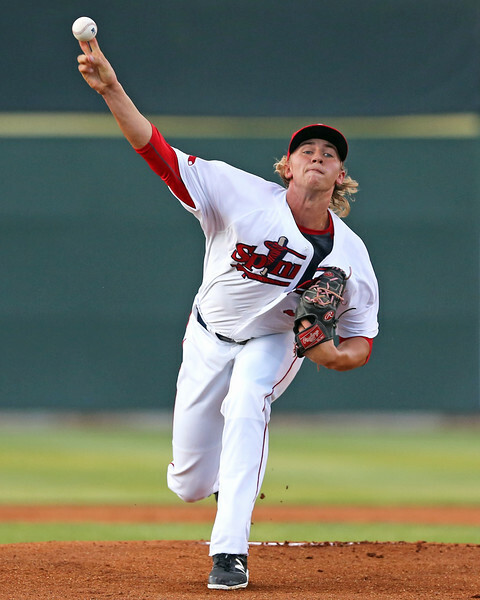 -- After a suspension ended his 2015 season early and an off-the-field incident delayed the start of his 2016 season, 2014 first-rounder Michael Kopech finally made his season debut in a rehab start with the Lowell Spinners last Friday (which our own Chris Hatfield reported will be his only rehab appearance before joining High A Salem this week). Kopech was definitely rusty in his first start of the year outside of Fort Myers, only lasting four and a third innings, allowing four walks and four hits and recording four strikeouts, but he flashed the potential that makes him one of the top pitching prospects in the system. Kopech has filled out considerably since he joined the system, now sporting a very muscular, prototypical pitcher’s frame. He throws from a three-quarters arm slot with a high leg lift and quick, loose arm. Kopech starts with a wide base with his hands by his chest, bringing them down to his waist and back up for his windup. His delivery has a lot of moving parts, with long arm action and hook behind, and he does not consistently finish his delivery. During this start, Kopech had some trouble with his delivery, as his arm was getting out ahead of the rest of his delivery, resulting in him consistently missing glove-side and struggling with his breaking ball. Kopech’s fastball sat 93-97 mph in this outing, topping out at 98 mph. He was mostly 94-97 for the first three innings, but his velocity ticked down a bit in the fourth, sitting more 93-95 mph and touching 96. The pitch showed life and arm-side run, but he had a lot of trouble locating it, missing consistently glove-side and up. He did not show much command of the offering either, especially to the arm side. In other looks, he has shown much better command and control, so the struggles were likely the result of rust and adrenaline in his first start in regular season game action in more than 11 months. Even with those struggles, he still got nine swing-and-misses with the pitch and recorded three of his four strikeouts on heaters. With refinement and improved consistency, it has the potential to be a plus-plus offering. Kopech showed three secondary pitches during this outing: a slider, curveball, and changeup. Usually, Kopech’s slider and curveball have clearer separation, but in this start, the two started to blend together. His slider generally is in the mid-80s, but it was mostly in the low-80s, with one coming in at 85 mph. He struggled with his release point of the pitch, often wrapping it and pulling it glove-side. It lacked the sharp bite it usually has and was sweepy, with horizontal break. At its best, the pitch shows plus potential, but the version he showed during this game flashed average at best. Kopech’s curveball came in 79-82 mph, usually with up-and-down, 12-to-6 break. Some showed more tilt, however, and he again struggled with his release, often holding onto the pitch too long and bouncing it down in the dirt. The pitch did flash above-average-to-plus on occasion, and he got three swing-and-misses and one strikeout with the pitch. We had heard that the organization was shelving his curveball for the time being to focus on his other pitches, but it seems he is throwing all four of his pitches again. As a result, it will be key for Kopech going forward to refine both breaking balls and regain the clear separation between the two that he has shown in the past. Kopech also used his changeup, but sparingly, only throwing it three times during the outing. He lacks feel and confidence in the pitch, with it showing some drop on occasion but generally being on the firm side, like a fastball that he took something off of. The pitch is a work in progress at this point, behind both his breaking balls when it comes to secondary offerings. In all, the outing was a good first step for Kopech. It accomplished the goals of getting him back out on a mound in a regular season, professional game and throwing all four of his pitches against better talent than what he would have seen in extended spring training. He showed enough that the organization was comfortable promoting him to Salem for his next start, and his next steps will be regaining the stuff he showed before his injury and adjusting to a new level of competition.